In short: The economy is starting the year on solid footing, broadly (if not fully) recovered from the financial recession and continuing its uneven pace of moderate growth. After more than seven years of gains, already 40% longer than the average expansion, Washington faces the challenge of both extending and boosting growth before the next downturn. After 92 consecutive months of expansion, the economy is still chugging along. 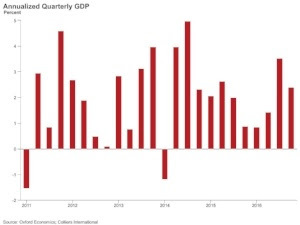 Though GDP growth dipped in Q4 2016 to just 1.9%, shy of consensus expectations and well below the revised annualized rate of 3.5% in the third quarter, much of the volatility is explained by a one-off trade issue that inflated the third-quarter figure and suppressed the fourth quarter. The larger story is that GDP growth surged from only 1.1% in the first half of 2016 to a relatively strong 2.7% in the second half, on par with the 2.6% growth in 2015. Still, growth for all of 2016 was only 1.6%, the weakest annual performance since 2011 and barely half its long-term average of 3.1%. GDP has not reached 3% since 2005. Consumers continue to be the main driver of growth, supported by job gains and rising wealth. Home values and equity prices are both at record levels, though wage growth continues to be slow. Overall, consumers are feeling good, with consumer confidence near a 15-year high. Home prices rose further into record territory in November, after finally reaching a new peak in September. In sum, consumer spending rose at a respectable annualized rate of 2.5% in Q4, following a 3% growth rate in Q3. Other bright spots in the GDP report included business investment (+2.5% annualized) and especially residential investment (+10.2%). The most notable weak spot in the economy was net exports — the first net trade drag in a year — as exports fell 4.5% while imports surged 8.3%. Overall, economic fundamentals should keep property markets strong in 2017 and going into 2018. As we have seen through almost the entire cycle, despite subpar growth, the economy has expanded enough to fill our empty real estate, helped by the below-average rates of new construction. Fueled in part by historically low interest rates and strong offshore interest, property prices have surged to new highs. In turn, this has supported exceptionally strong investment returns for some six years now. Even before taking into account anticipated policy directions from Washington, the property markets are riding enough momentum to keep the party going at least a bit longer.